Is A Chick-Fil-A Boycott In The Works? 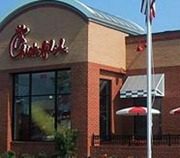 Chick-fil-A president Dan Cathy took a firm stance against gay marriage in an interview with the Baptist Press on Monday. In the interview, he stated that Chick-fil-A is not a Christian business – which may come as a bit of a surprise to those of us who visit the fast food restaurant and are routinely told to “Have a blessed day!” when we pick up our food. Cathy went on to explain. “In that spirit … [Christianity] is about a personal relationship. Companies are not lost or saved, but certainly individuals are.” He does feel, though, that Christians are missionaries in the workplace, according to the Baptist Press. “If you’re obedient to God you are going to be evangelistic in the quality of the work you do, using that as a portal to share [Christ],” said Cathy. So has Cathy sparked a huge boycott of Chick-fil-A with his anti gay marriage comments? According to ABC News, actor Ed Helms is jumping on the boycott bandwagon. But he’s the only celebrity that has gained much attention for taking a stance so far. About 40 various Chick-fil-A boycott pages and groups have been started on Facebook, some several years old, with the largest only garnering 1538 likes since it was created – back in January of last year. And a Washington Post poll (unscientific, of course) on this question is running with 66% in favor of continuing to visit Chick-fil-A, and 34% saying they won’t go there again. On the face of it, the boycott doesn’t appear to be taking on much steam, at least not yet. Are you going to continue going to Chick-fil-A, or has Cathy chased you away with his position? Leave your (appropriate) comments below! I used to love to eat at ChickFila but I won’t eat there now. Mr Cathy should have kept his personal comments to himself because now he’s probably hurt all of their businesses in general. He should go back to the bible and re-read the verse that says we should not judge other people, that’s God’s job. I guess if you don’t share his beliefs it’s ok for him to judge you. Wonder if ChickFila would refuse openly Gay people’s money when they visit the restaurant? As a gay Christian (yes, there are gay Christians), I do not like Chick fil a’s bigotry. I will NOT eat there again until the company does something to prove that they are not against the GLBT community. Oh, and by the way, their food is not that great. My mother used to get dinner for us every Thursday from Chick-fil-a. That will no longer happen. There is too much bigotry in this world to support a company that comes out and says gays and gay marriage is wrong. I don’t understand people that use God to belittle other human beings. The God I worship is a loving God. We are all his children. I wonder how many of those people think Blacks, Jews, Irish, American Indians, etc. are less than anyone else. I will continue coming from a place of love for all my fellow children of God. I will start eating at chick-fil-a more often. The food was always good. Now it’s twice as good. I admire and respect Chick-FIl-A opinion on gay marriage. So many Christians are belittled and berated for standing up for God laws. What will these people do when they stand before God and explain their actions and reasoning I will continue to purchase food from Chick-FiI-A they have the best food around.